Beautiful locally made solid wood storage beds are the answer! 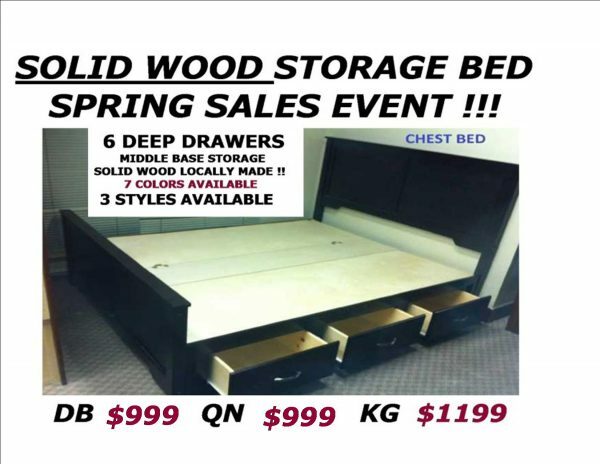 with our spring storage bed sales event you get the quality you want , at the price you deserve! All solid wood construction for years of usage! 6 deep drawers , plus a lift up center panel in the base for lots of added storage. Choice of 3 different styles of headboard and foot board , plus 8 different color choices! All locally made of solid wood ( no particle board) available usually in 2 weeks! Lots of matching furniture pieces available , to outfit our entire bedroom!